Greetings from St. Michaels, Maryland! I'm here for a few days before driving back across the country and I thought I'd say hello and happy 4th to all friends and readers alike! Even if you're international, happy random day of July! I just got this Bernie Dexter dress last week after missing out on it after it went out of print a few years back! Thank goodness for eBay...am I right? And, I've been hard at work trying to be consistent with a YouTube channel and because I knew I'd be traveling I assembled a three part series on packing! I'm learning as I go, so please withhold judgement! My most recent video may be the best (3rd in the line-up) due to the fact that I'm a work in progress, but hey, I'm having fun regardless and I think all of them have some form of entertainment + valuable how-to tips! Cute 4th of July video! I laughed a ton. Thanks for teaching us about little known facts about our independence day. I loved the dress, it's really so nice and perfect for the celebration! I liked the Just Shair video, the name pun is really nice - Just Share. In a world where people like to get all for themselves - not everybody, but many, of course - the name Just Shair (share) is really great! I had to smile about a place being called a diva! Really sweet and funny :) My blog will be down from Thursday till Sunday, so I will also be a bit away. I am so happy, finally migrating it, I should have done it last year, but it's never too late :) So don't worry about hit and miss, just enjoy the week with the things you have to do! Hugs! Loving that anchor dress!! I hope you had a great long weekend! Great video dear! Love your dress! You look great! How exciting that you got celebrate the 4th away from home. I hope that you're having a sunny, fantastic trip, dear Lauren. Love your awesome nautical print dress to no end. Anchors for the win big time, in my books. What a beautiful dress, love your pictures! Happy (late) 4th of July!! Hope you had a great 4th July celebration, Lauren! I love your dress, girlie, it's so perfect for the holiday! I hope you had a wonderful time in Maryland, I'm sure the fireworks were gorgeous there! Thanks so much for sharing and I hope you have a wonderful rest of the week, beautiful! Happy 4th gorgeous! You look so pretty in this Americana outfit! That dress is so cute. Have fun traveling. Love that festive dress, lady! Hope you had a good 4th! LOL Happy random day in July! You are too much Lauren in the best of ways! Congrats on finding this dress on ebay! I love it when I find out of print dresses I've been looking for there! Such a perfect dress for the 4th! Also your dog is so cute! Love this dress of yours, perfect stripes & anchors and can be worn all summer long! Your dress is so beautiful. Great video! 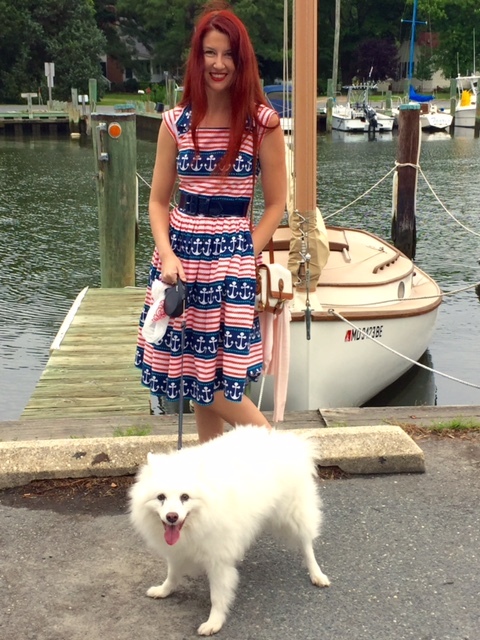 Gorgeous 4th of July ensemble and what fun videos!!! Such a cool look! So stunning. lovely Video Share.